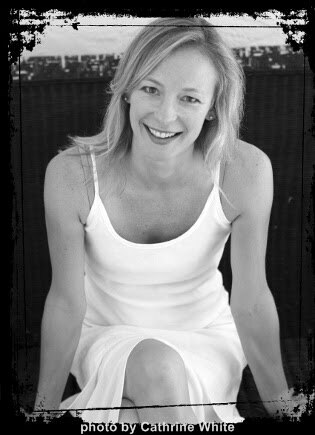 I’m super excited to introduce today’s flashback victim: Jen Nadol, author of THE MARK (which I’ve read and loved!). When sixteen-year-old Cassie Renfield realizes the glow she’s always seen around certain people means death is imminent, she struggles to understand her “gift”. How does the mark work? Why is she the only one who sees it? Most importantly, if you know today is someone’s last, should you tell them? Today, Jen is a little more…feminine. She grew up in Reading, PA and has lived in Washington DC, Boston, NYC and now, in a 150 year-old farmhouse in Westchester County, NY with her husband and three young sons. 1) So, Jen, did you (or any of your friends) actually marry your high school sweetheart? Not me. I didn’t date much in high school and my only longer-than-a-month boyfriend was gay. But three of my friends married their HS sweethearts, including Jess – on the right in the picture – who lives up the block from my parents now. We didn’t usually dress like dudes, btw. It was Halloween. I’d have loved email and hated cell phones, but stalking people on Facebook would have been my secret addiction. NOT tested whether I could still do a backflip five years and a few drinks after my last gymnastics class. 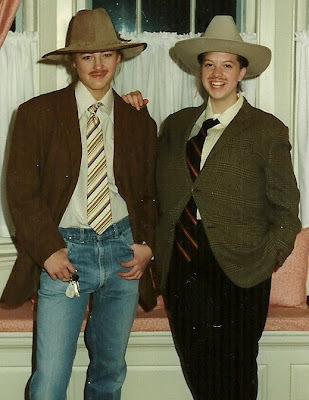 I have a picture of my best friend and I in high school where I dressed up like a guy and my best friend dressed up like she was going to Homecoming. When my mother saw the picture she said "Who is that greasy guy Sommer is with?" Great interview. Loved the photo! Jen looks a little like Blake Lively. What a good sport to post this pic! That picture is just classic! I love the face your making in it. The picture is great!! I am glad you did this interview. I am adding The Mark to my reading list for 2010. Thanks for sharing!! Hahaha! I love it! Makes me want to go dig out old halloween pictures. LOL! Why do authors always have such interesting lives?! Great picture. Looks like there are some great memories behind it too! The only time I dressed up as a guy is when my mom told me to exchange clothes with my brother. So I dressed up in his favorite clothes, and he's stuck with my dress. The look on is face was priceless. Awesome picture!! It seems like everyone would have loved Facebook back in high school. Understand the secret addiction to Facebook - was there once - but lately I've gotten somewhat sick of it. (That's when Twitter came along). stalking people on facebook is my secret addiction too! mostly to people i know though. but not that creepy-ish.